Billionaire conservative donor Robert Mercer distanced himself on Thursday from former White House chief strategist Steve Bannon and right-wing provocateur Milo Yiannopoulos, while simultaneously announcing he would sell his stake in Breitbart to his daughters and step down as co-CEO of the hedge fund Renaissance Technologies. The fact that the Mercer family has funded and had an ownership stake in the far-right website Breitbart -- which Bannon led before moving to Donald Trump's presidential campaign, and has since returned to as executive chairman -- has been known publicly. The details of his relationship with Yiannopoulos and the funding that Mercer may have provided to him, though, while widely speculated upon, have never been fully disclosed. 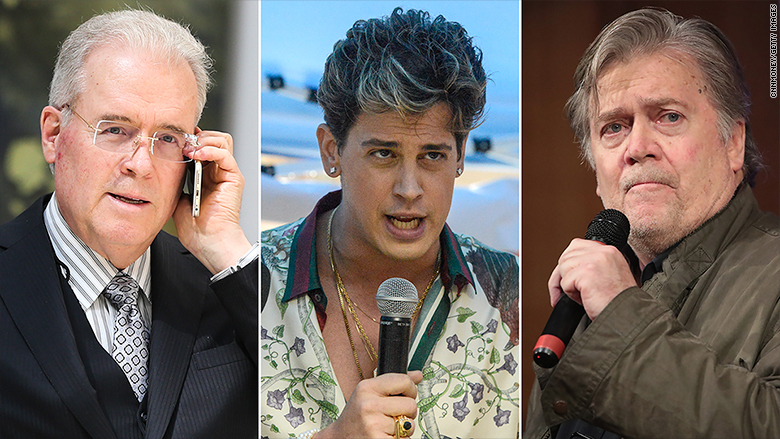 Mercer's announcement came just weeks after BuzzFeed published an explosive exposé linking Breitbart and Yiannopoulos, who formerly served as a senior editor at the website, to white nationalists. On Thursday, BuzzFeed reported that its story had angered many people inside Renaissance Technologies. In a letter sent to colleagues, Mercer said he has become "the object of a great deal of scrutiny in the press," much of which has been tied to his activity as a conservative donor. He said he had previously declined to comment on stories about him because he imagined "with time the attention would dissipate," but felt compelled to speak out now to "correct some of the misinformation." "My goal is simply to explain my thinking, the very essence of which is that all of us should think for ourselves," he wrote. Mercer explained that he believed in small government and, thus, has supported conservative causes. He then addressed his relationship with Bannon, who did not immediately respond to a request for comment. Mercer said he supported Yiannopoulos "in the hope and expectation" that he would help "promote the type of open debate and freedom of thought that is being throttled on many American college campuses today." Then, in an extraordinary rebuke, Mercer said it was his opinion that the "actions of and statements by Mr. Yiannopoulos have caused pain and divisiveness undermining the open and productive discourse that I had hoped to facilitate." "I was mistaken to have supported him," Mercer wrote, "and for several weeks have been in the process of severing all ties with him." Yiannopoulos told CNN in a statement that he was "grateful for Bob's help in getting me this far in my career." "I wish him and the family all the best," he added. Mercer, citing "personal reasons," said he would sell his stake in Breitbart to his daughters, a move that suggests not much may immediately change at the right-wing website. His daughter Rebekah Mercer is a strong supporter of President Trump and previously served on the executive committee for his transition.